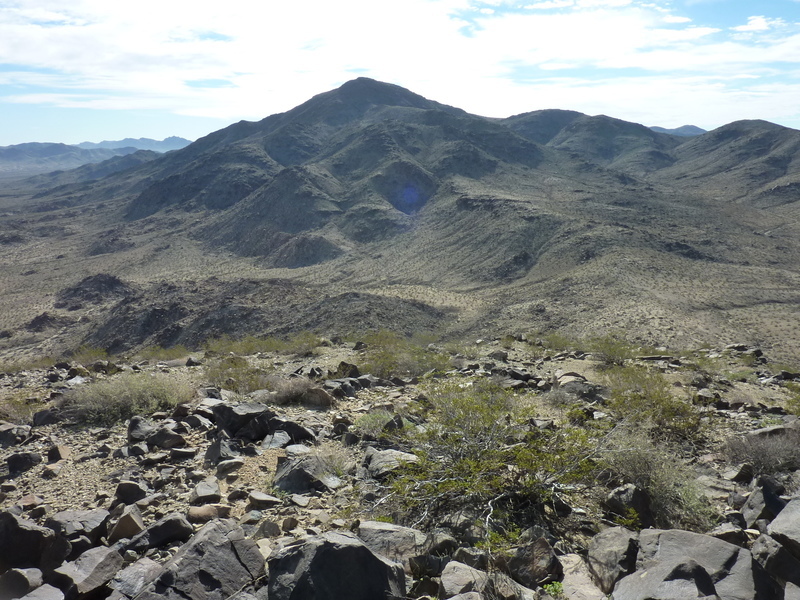 The Eagle Mountains are a rather broad range occupying a good chunk of the southern part of Joshua Tree NP. The highest point is Eagle Mtn, a DPS summit and P2K that I had visited in 2008. Additionally, there are four other P1Ks in the range, all unnamed and somewhat remote, which I've been making steady progress on reaching. We had done one just a few days earlier, while today's objective was Peak 3,994ft, the last of the four. Located in the heart of the range some 7mi from the dirt Black Eagle Mine Rd, it would take up the majority of our day. There were also a few bonus summits in the area with more than the requisite 300ft of prominence that we planned to do as well. Having spent the night camped just outside the south entrance to the park, we were up before sunrise to drive into the park for the hike. We left two vehicles off the pavement at the start of the Black Eagle Mine Rd, driving Karl's Element to the start about 2mi from the junction. Starting out at 7:20a, the first hour was spent in crossing the desert flats to reach the base of the mountains almost three miles away. It was a pleasant enough hike, with few obstacles and easy walking over terrain primarily composed of compacted sand and gravel. We entered a sandy wash that would take us into the range towards our summit, getting us several miles closer over the course of about 45min. The wash got us to within half a mile of Cuatro BM, one of the bonus peaks and the first stop of the tour. A fairly easy climb of about 400ft got us to the summit by 9:30a, just over two hours after starting out. In addition to the benchmark, there was an old survey pole still standing after many decades, held up by rusty guy wires on four sides. Barbara and Gordon had left a register in 1981 as we had expected (I have Gordon's ascent records in my GPSr, so it's now easy to figure out where he's been). The only other visitor was someone looking to tag all the VABMs in Joshua Tree - a rather specialized hobby, I imagine. A mile and a half to the southeast rises the higher summit, Peak 3,994ft - it hadn't been visible during the approach and through the sandy wash. It's connected to Cuatro BM through a low saddle which we headed down to once we left the summit. Somewhere near the saddle I found a half-buried, rusty gallon tin discarded long ago. I couldn't quite make out the words to determine its contents, but the lettering appears to be of an old style from the first half of the 20th century. We then spent the next 45min climbing more than 1,000ft over the course of a mile to reach Peak 3,994ft from the northwest. Lo and behold, Gordon & Barbara had left an identical register on this summit on that same day in 1981. The summit's P1K status had also attracted John Vitz in 1993 and Adrian/Carey in 2012, ours making the fourth party in more than 30yrs. As it was only 10:40a, we had plenty of time to head off in the direction of Peak 3,418ft, our other bonus peak, about 1.5mi WSW. We dropped south off the summit of Peak 3,994ft and then made our way west across several minor drainages and bumps that lay between the two summits. While we were scrambling down one of these rocky bumps I let out a shout that quickly caught my companions' attention. I had seen a large chuckwalla whose head and torso were about a foot in length disappear into a crack below a rock it was basking on before being disturbed. We stealthily approached the rock and stuck a camera over the crack before looking into it ourselves. Only there was no chuckwalla hiding there. It had somehow vanished into the rocks unseen and unheard, half making me think I'd imagined the thing. Karl and Patrick may have wondered the same thing. Peak 3,418ft proved no great desert summit. A wooden stake used by surveyors lay on the ground, with no other signs that anyone had been here since that day long ago. Of more interest to us was a formation that Karl had spotted, an impressive granite rock pinnacle about 3/4mi to the northwest which we later dubbed "Karl Rock". Since it was more or less on our way back towards the car, we decided to pay it a visit. We descended Peak 3,418ft's NW Ridge and made our way over rocky terrain to Karl Rock. It's big, bold, and unfortunately composed of less-than-ideal granite. We explored one possible route up from the shady east side only to be rebuffed, and another on the south side that didn't get me very far - only about 1/4 to 1/3 of the way up before it was more than I was willing to risk. The granite is grainy and decomposing, not the safest stuff to be scrambling around. The west and north sides were even more imposing. I gave up to rejoin Patrick waiting below, and then we returned to the east side to pick up Karl who we'd left napping on a rock slab. This hunk of granite would have to wait for braver souls to visit its summit.